The TurkStream natural gas pipeline project, which will carry Russian gas to Turkey and Europe, will be completed by the end of 2019 as planned, according to Asli Esen, the project's spokeswoman on Tuesday. During a visit to the TurkStream facility located in the Russian coastal city of Anapa, Esen said the offshore section would be 95 percent completed by the end of October. The Russkaya compressor station was a main focus of the visit being the first of the facilities built for the TurkStream project. The station is an important part of Gazprom's giant network consisting of 172 thousand kilometers of natural gas pipeline and 254 compressor stations. The station's official Anatoly Koltakov explained that the station's main function is to provide pressure to allow natural gas to travel 930 kilometers along the Black Sea ensuring a capacity of 31.5 billion cubic meters is carried to Turkey. Serbia is ready to join the TurkStream pipeline project, Serbia’s minister of mines and energy said on Friday. "The possibility of 10 to 15 billion cubic meters of Russian gas from Turkey going on to Bulgaria, Serbia, Hungary, and Austria is a serious chance to improve energy security,” Aleksandar Antic told a two-day Eurasian Energy Security Forum in Serbia’s capital Belgrade.“This will open up the possibility of developing gas and gas industries. "Gazprom to build TurkStream's 2nd land section in 2019Antic said construction of the pipeline will soon be completed, and Serbia joining the project would be a great opportunity for improving energy security for both the nation and the region. Serbia is ready for this opportunity, but it will need its "neighbors of Bulgaria and Hungary" to do so, he added.Separately, Peter Sijarto, Hungary’s foreign and trade minister, said he sees no reason why the TurkStream could not continue towards Bulgaria, Serbia, and Hungary, also asking why the European Union has criticized the project.The TurkStream project is an export gas pipeline set to cross beneath the Black Sea from Russia to Turkey and also further extend to Turkey's borders with neighboring countries.TurkStream's first line is set to carry 15.75 billion cubic meters (bcm) of natural gas to Turkey. The project will have a capacity of 31.5 bcm with a second line that will go to Europe. Only 3.5 kilometers from the Russkaya station, is Anapa where a landfall facility was built - the last destination before the pipeline's sub-sea section begins its journey to Turkey. "Following the completion of the Russkaya compressor station, the construction of the TurkStream landfall facility was completed and the construction of TurkStream on the Russian coast was completed. The robots that will provide the annual inspection and maintenance of TurkStream's submarine will also enter the pipeline through this special arrangement here," said facility's official Anton Barishev. Natural gas transmission will take around 52 hours from Russia's Anapa to the destination in Turkey, at Kiyikoy located in the Kirklareli province in northwestern Turkey, according to the officials. Russian energy giant Gazprom is planning to start the construction of the overland section of the TurkStream second gas pipeline in 2019, Gazprom’s deputy chairman announced Thursday.Alexander Medvedev, speaking to the Gazprom corporate magazine, said the company aims to transfer a record volume of 200 billion cubic meters (bcm) of gas by the end of this year, up from the 148.2 bcm exported in the first nine months of 2018. "The construction of the offshore section of the second transit line of TurkStream is in full swing. Completion of the deepwater laying will be completed soon," Medvedev said. "Next year, we also plan to begin construction of the land section of the transit line in Turkey. Currently, Gazprom is negotiating with the Turkish company BOTAS. 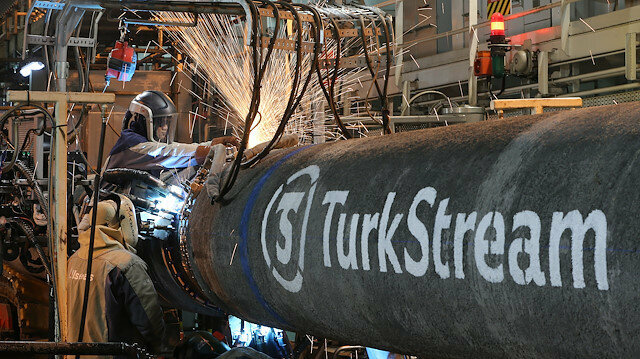 TurkStream is scheduled to go into operation in December 2019," he added.The TurkStream project is an export gas pipeline, which will not only span across the Black Sea from Russia to Turkey but will further extend to Turkey's borders with neighboring countries.TurkStream's first line will carry 15.75 bcm of natural gas to Turkey. The project will have a capacity of 31.5 bcm with the second line that will go to Europe. The control room where natural gas transmission will be monitored will be located at the headquarters of the TurkStream project company in Amsterdam, the Netherlands. According to the information provided by the TurkStream authorities, the project was designed to operate for at least 50 years. The project consists of two lines, each with a length of 930 kilometers and totaling 31.5 billion cubic meters of capacity. The TurkStream natural gas pipeline project will supply natural gas from two pipelines as of Jan. 1, 2020, Russia's Energy Minister Alexander Novak said on Tuesday. In an interview with Rossiya 24 TV channel, Novak said that negotiations are still ongoing over the route options for the second pipeline with all concerned countries in agreement on the project's route map.“We have different options. The first route is through Greece to Italy. And the second option is to stretch this pipeline to Serbia, Hungary and Austria through Bulgaria,” he said, adding, “Our priority is to stretch the second pipeline through Bulgaria to Austria. "He explained that with the project progressing on schedule, "the project may start to supply natural gas as of Jan. 1, 2020 with a capacity of 31.5 billion cubic meters (bcm) from two pipelines.”Alexey Miller, chairman of the management committee of the Russian energy company Gazprom, also said in a statement last week that the construction of the offshore part of the TurkStream project would be completed in two months.The TurkStream project is an export gas pipeline, which will not only span across the Black Sea from Russia to Turkey but will further extend to Turkey's borders with neighboring countries.TurkStream's first line will carry 15.75 bcm of natural gas to Turkey. The project will have a capacity of 31.5 bcm with the second line that will go to Europe.